Hey guys it’s Marcus here from AffiliateMarketingDude.Com! 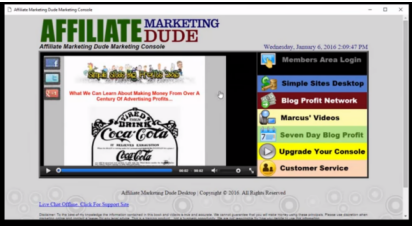 I have finally completed the brand new affiliate marketing dude marketing console for you! Let me show you how this thing is gonna help you make MONEY ONLINE STARTING TODAY. First, go to affiliatemarketingdude.com. Put your name and email in the boxes. Click the button and download this little file right here called AFDsetup.exe. If you’re on a Mac there’s other instructions there for you as well but it’s pretty similar. Then go ahead and open this file up. It’s gonna ask you if you want to open it. Then go through the simple installation. It should take you a couple of seconds. Very simple to do! It’s going to install the affiliate marketing dude desktop, the console right on your desktop. So you have this little icon, you click it whenever you want and it brings up your handy-dandy console. Really cool, really easy! The neat part about this is it’s dynamic. So as we change different parts of your members area, different parts of your software, you can actually go through and get the updates right away. For example, if you go through the blog profits course like this you could simply watch the videos and follow along as you go through the videos with the tools and instructions in your little toolbar hub. Super easy to do. This is the next best thing to me. Actually being in there in your office or your home and saying click this, now go here, now fill this out. VERY, VERY EASY! YOU’RE GONNA BE MAKING MONEY IN NO TIME! You’ll also notice how this console has made it even easier for you to get access to your favorite products that includes our brand new members area login to login and use the toolbar with all the upgrades and updates and special areas for members only. The simple sites big profits desktop which you can click and log in as you’ll notice we now have one login for all of our products that make it even easier for you to get started and once you’re logged in you can go to the desktop of your choice. You can see this has tons of different icons. Tools are simple sites big profit software and you can also use the toggle to go back and forth throughout each page making it even easier to switch between the desktops check out my latest videos and more! Again this has all the tools and everything you need to be organized in a very bright easy colorful way that you can use to start making money even easier than before! We’ve taken out all the stops and compiled exactly what you need to start making money online. 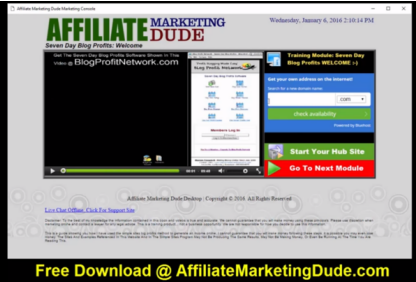 So go ahead and hop over to affiliatemarketingdude.com, download this software. As you’ll notice in addition to putting an icon on your desktop, the software is also going to show up in your program files. You’ll see it your recently added as well as in all apps and everything like that where you have affiliate marketing dude. Very simple, very easy to use! All you gotta do is get started and we’ll have you making money in no time! If you like the free version of the software you’re gonna want to upgrade to the simple sites the blog profit network and all of our training to get the best affiliate marketing training out there so that you can start making money online! If you want to make it even easier you could just drag it right over to your life at a glance or whatever if you’re using Windows. Now you’ll notice that the Google Chrome icon came up for this one and that is because this system is using the Google Chrome browser so you’re gonna want to make sure that you install the Google Chrome browser which you’ll find after you opt in that means put your name and email on the page that affiliatemarketingdude.com and we’ll have instructions for you on how to do that. Most people have google chrome anyway it’s a great browser to use so do that first and then download your affiliate marketing dude console. I hope you like the new format where it’s really easy to go through. As you can see we’ve made it super simple. We’ve taken out all the stops we’ve made, all the icons you need. As you can see here when you go through the various things, icons change your power search comes up, your tools your modules and everything making it super easy for you to start making money today! This is your chance to start making money in 2016 and we’ve made the basic version of this desktop free so that you can use my tools and then only after you’ve said Marcus this is awesome I want you to join me in our courses so that I can help you even further by giving you sites reviewing what you’re working on and helping you make even more money! Again, I thank you for being a student of mine and following me through this process and I look forward to seeing you in the affiliate marketing dude console! 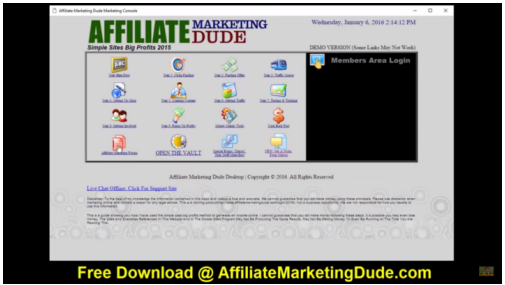 Go ahead and download the software at affiliatemarketingdude.com get that AFD setup file; run it; then start using your affiliate marketing dude desktop console. Thanks again and I’ll see you on the inside at affiliatemarketingdude.com!